A manual and atlas of medical ophthalmoscopy. Gowers, Sir William Richard, 1845-1915. London : J. & A. Churchill, 1879. Description : xi, 352 p.,  pl., 24 pp. adv. ; ill.: 29 figs., 10 pl. photo., 4 colotype, 2 chromo. ; 22.8 cm. Second edition : Philadelphia, P. Blakiston, & London, Churchill, 1882. Other editions : 3rd 1890 ; 4th 1904 ; 1992 commemorative. German edition : Die Ophthalmoskopie in der inneren Medizin. Ein Handbuch und Atlas, 1893. Subject : Ophthalmology — Ophthalmoscopy. Swann Sale 2107, Lot 172; March 8. 2007. Gorin, History of ophthalmology, p. 179. Osler 2786 (3rd edition, with hand written letter on Paget's disease). The Bernard Becker Collection in Ophthalmology, 158. Garrison, History of medicine, p. 643. Almost from the beginning Gowers's principal medical interests lay in neurology, culminating in his great work on the diseases of the nervous system in 1886. His first book of any real importance, however, was this manual on ophthalmoscopy. The plates were all prepared after the author's own sepia drawings, which, according to the Dictionary of National Biography (1912-21, p. 222), "made them for long the standard illustrations on the subject." (excerpt from the Becker catalog). 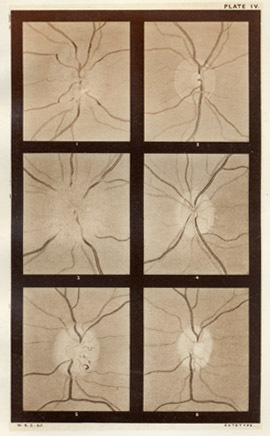 The 1904 edition includes an appendix titled, How to sketch the fundus oculi (pp. 286-289). Gowers writes a wonderfully detailed description of his sessions with the pencil and he encourages the medical student to take up rendering, stating that dexterity with the ophthalmoscope will ensue from the practice. The first intention in the preparation of the following work was the publication of the series of illustrations of medical ophthalmoscopy contained in the appended plates, and of the cases from which they were made. I have thought, however, that the utility of these would be increased by the addition of a systematic account of the subject, which they illustrate. With one or two exceptions all the cases described and figured were met with in the course of purely medical work, chiefly at University College Hospital, and at the National Hospital for the Paralysed and Epileptic. In the preparation of the illustrations, great care has been taken to secure the utmost possible exactness. The autotype plates are reproductions of sepia drawings; and this method has been chiefly employed because by it a more exact representation of delicate pathological appearances can be obtained than by chromo-lithography. This method has also the advantage of fixing the attention on the changes of form, rather than upon the alterations in colour, which, important as they are, very often mislead the inexperienccd. Chromo-lithography has been employed for some subjects in which the changes of tint are of predominant importance. It is intended that the autotype plates should he studied by the aid of the descriptions prefixed to them, and it is believed that, thus examined, those who are accustomed to the use of the ophthalmoscope will not miss the absent colours. With one or two exceptions, specified on p. 321, the drawings were all made by the direct method of examination.